From Twilight Tomboy to Balenciagabeauy muse?! Post-public drama, Kristen Stewart tells how she's grown into the girly thing. "I'm starting to carry a bag and even put on lipstick. Very mature for me!" In Balenciaga at the MET Gala: "Balenciaga was the first fashion brand I could call by name and go, 'Ooh, I like that!'" says Stewart. 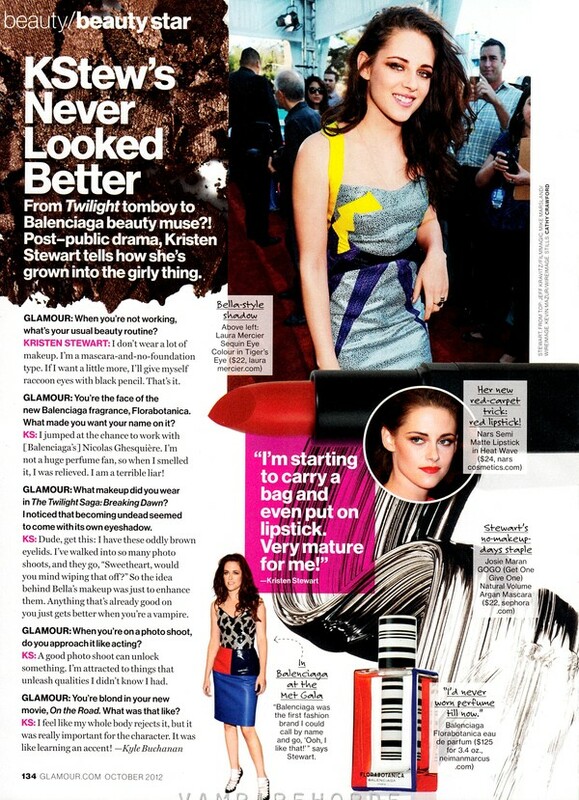 Kristen: I don't wear a lot of makeup. I'm a mascara-and-no-foundation type. If I want a little more, I'll give myself raccoon eyes with black pencil. That's it. Kristen: I jumped at the chance to work with [Balenciaga's] Nicholas Ghesquiere. I'm not a huge perfume fan, so when I smelled it, I was relieved. I am a terrible liar! Glamour: When you're on a photoshoot, do you approach it like acting? Kristen: A good photoshoot can unlock something. I'm attracted to things that unleash qualities I didn't know I had. Kristen: I feel like my whole body rejects it, but it was really important for the character. It was like learning an accent!